This two tier wrought iron flower planter is idealto be used for a patio planter. The flower baskets compliments all wooden planters, wrought iron planters and window boxes planters. Easily assembled in minutes to achieve stunning flower containers. The metal baskets are made of strong rod and strip construction. 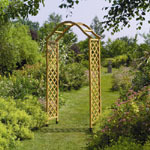 The flower baskets have a durable black wrought iron crackle finish. The flower baskets are complete with co-co liners. Top basket 30cm (12"), bottom basket 35cm (14"). Total height of two tier flower planter 88cm (35"). This three tier wrought iron flower planter is idealto be used for a patio planter. The flower baskets compliments all wooden planters, wrought iron planters and window boxes planters. Top basket 30cm (12"), middle basket 35cm (14"), bottom basket 35cm (14"). Total height of two tier flower planter 1.0m (3' 3"). 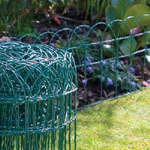 These metal jardiniere garden planters are elegant single basket planter. The liner are included. Size: 36cm basket x 75cm high. This outdoor flower planter is ideal for any garden, patio or balcony. Outdoor containers compliment other wooden planters, wrought iron planters and flower containers. This larger flower planter is made from steel rod strip construction with a black crackle finish. Dimensions: 60cm x 20cm x 40cm. Traditional wrought iron planter with liner is made from black coated steel rod and flat bar with crackle finish. These trough planters hold approximately 20 litres of compost. 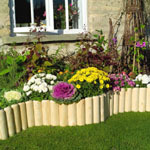 This patio planter will look stunning on any patio or decking areas of your garden. Size: 1000mm high x 400mm wide x 400mm deep.